97 Ford Mustang, 4.6L DOHC, Precision 76mm GTS turbo. I'm running an MSV3 PCB, with an MSII, and a couple of small circuits on the breadboard area for extra inputs and outputs. I'm running v2.36 of the MS2 code, and the extra outputs control my cooling fan and water pump. I'm running an EDIS-8 for ignition, with an MSD-DIS4 driving the 8 COP's (in a "waste spark" configuration). Fuel is being delivered via 8 Holley Low Imp 65 lb/hr injectors. I'm not running an IAC at the moment, but have the provision for the Ford PWM idle valve in place...maybe one day. The harness is one that I put together myself. I started with the idea of trying to use the stock harness, but REALLY wanted to clean up the engine bay, and wanted to convert to coil-on-plug, so making a new one made more sense. I did go ahead and use the relay board though, it really made things much cleaner! I'm running a TechEdge wideband for WB feedback, and have a Baumann TCS controlling the transplanted 4r70W auto trans. (wanted to have OD for the long drive to the local drag strip!). Amazingly, the car fired up on the first turn of the key!! I had some issues with flyback noise being generated from the low-imp injectors, and ended up having to return the flyback noise on the +12v line outside of the MS. Other than that, the install has gone perfectly! I have to say how pleased I am with the MS... I switched from a FAST engine management system that I ran for about 3 years, and so far, the MS has been MUCH more predictable in the way it reacts to changes in the tune. A picture of the new carputer, thanks to "XtremeSteel" at mp3car.com, where I saw this design! Last edited by Turbo4V on Sun Sep 03, 2006 10:38 am, edited 4 times in total. Looks beautiful! I have been waiting and waiting to setup my 4.6 w/MS and seeing yours makes me envious. By the way, how does that turbo feel with the automatic? My setup is very similar with a 72mm turbo and I've been thinking of going to an automatic. 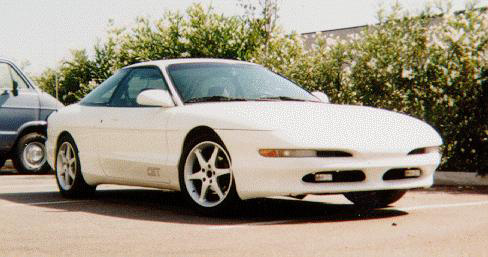 1994 Ford Probe GT 2.5L, T04B, 370cc, MS2. 1981 Ford Fairmont, 351c, MS1. The Cobra is something else with the Turbo on there. It spools up the 76mm pretty quickly (good boost by about 2500rpm or so, and by 3500RPM, full boost!). The car makes a hair over 600 to the wheels with about 10psi. I haven't turned it up much more than that yet, but understand that the turbo is good for about 20psi, so I think there's a bit more in it if I get brave and turn that boost knob some more! I'll have to wait a bit to give you more feedback on the auto, it drives really nice and get's into boost nicely, but I've yet to really get into it with the auto trans (still testing). I think the car will be much quicker though, and with the Bauman TCS, it's completely streetable, even with a 4000RPM stall! The Probe is very fun with the turbo, just last weekend I switched the setup to my (lower mileage) 94' Probe and added the Japenese rectangular port intake manifold. I can't wait to try it out and see how much of a difference it makes. Full boost at 3500rpm sounds great! Which turbine wheel/housing is mated to your turbocharger? I never thought I would say this, but I can't wait for winter -- to finish my 4.6L. I sometimes wish that I would have held onto the Probe when I had it, there wasn't much aftermarket stuff at the time though, and I was pretty new to the scene... If I knew what I do now, that would be an awesome car to have modded!!! I have a Precision 76mm turbo, with the GTS wheel, and the GTSH housing (.96 a/r). Basically, a more efficient, higher flowing Q-Trim turbo. Supposedly supports around 1100hp, not that I'll ever get there! LOL! Added a picture of the new carputer running Megatune. I installed this so that I can run megatune all the time, without having to cart around my laptop! I have to compliment you again; looks amazing! I have never seen one before. Do you have more information about the "carputer" how to build this ? Honda Goldwing GL1500SE, 2 TBI's Suzuki GSXR-750 running 5.2 Bar fuel pressure. There's some great information on http://www.mp3car.com. Basically, it seems you'd use a mini-itx based pc (low power consumption, small size), and a decent screen. You can get power suppliess that are tolerant of the fluctuating voltages in the automotive environment, and can last through nasty power events like cranking. They also do things like turn on and off the PC when the cars ignition is enabled/disabled. SRoss wrote: I have to compliment you again; looks amazing! I have never seen one before.